Will be able to build a solid foundation of the common body of knowledge in their discipline. 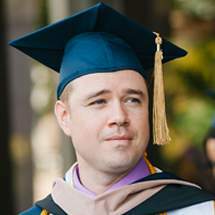 Graduates will be able to build a solid foundation of the common body of knowledge in the discipline. See the outcomes infographic below for more details on what the learning objectives established by Trident University mean to you and your educational journey. Terms, concepts and principles of the subject matter. Application of theory and frameworks to a variety of practical / functional situations. Utilize various media effectively (images, digital technology, and print) to construct sustained, coherent arguments, analytical explanations, narratives, reflections, and/or explications of issues and processes. Speak to general and specialized audiences intelligently, substantively, and confidently. Using mathematical equations, judging reasonableness, and/or communicating quantitative information via words, graphs, and tables. Considering the power and limitations of quantitative evidence in the evaluation, construction, and communication of arguments in their professional, civic, and personal lives. Identify information needs and search for information. Develop retrieval skills and critically evaluate information sources. Effectively utilize information in an ethical and legal manner. Analyzing, synthesizing, and evaluating information with the purpose of reaching a rational response or conclusion within the proper context. Including multiple source materials in courses. Comparing and contrasting differing views. Resolve ethical issues in selected ethical case studies. Reflect if their decisions are ethical within the contexts of their workplace and fields of study. Compare and contrast different resolutions to ethical issues. Trident's leaning approach prepares you to go further than you though possible. Learn more about our specific program learning outcomes in the course catalog. We are proud to be recognized as one of the best fully online colleges for students furthering their education. 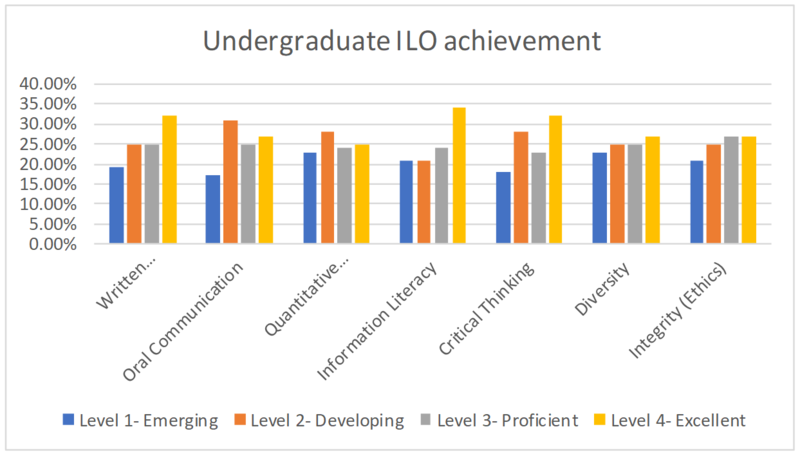 Trident International University measures students’ achievement of Institutional Learning Outcomes (ILOs) at the institutional, program, and course levels. 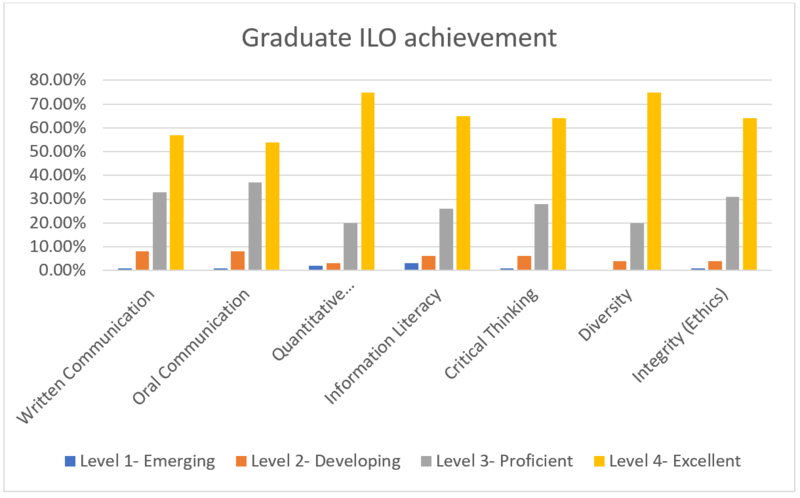 ILOs are based on the following core competencies: communication (written and oral), problem solving (quantitative reasoning), information literacy, critical thinking, diversity, and integrity (ethics). Specific content area knowledge is measured within each individual program and is assessed as part of the academic program review process. 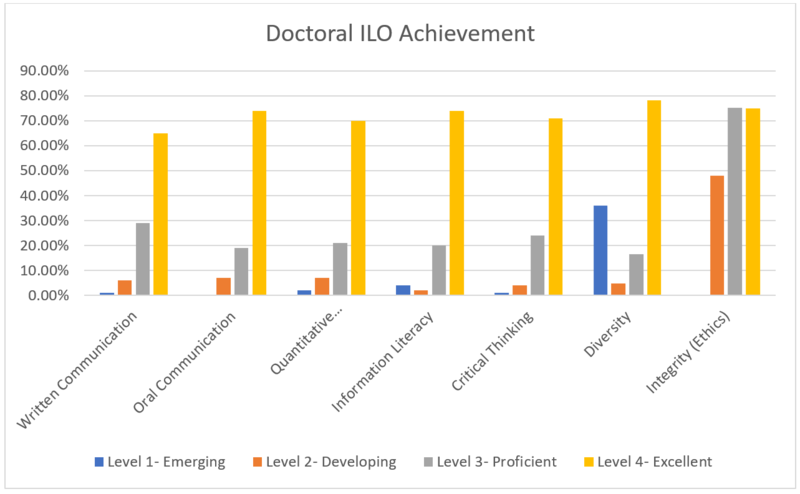 The tables below represent data from January 2014 to June 2018 and provide an overview across all programs, summarized by level (undergraduate, graduate, and doctoral).